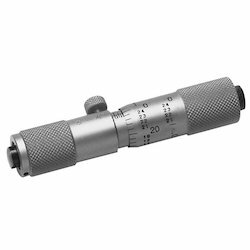 Pioneers in the industry, we offer tubular inside micrometer extension rod type and tubular inside single rod type micrometer from India. We are distributor & trader of Tubular Inside Micrometer Extension Rod Type. Wide range of ID measurements by combining extension rods (pipes) and anvils with the micrometer head. The 139 and 140 series use highly-durable/ large-diameter extension pipes. Series 137 supplid in fitted plastic case except 1550mm/60in come in wooden case. Series 139 supplied in fitted wooden case except 500mm/20in come in plastic case. We are distributor & trader of Tubular Inside Micrometer Single Rod Type.